Amid the crowded compact crossover market, the 2013 Ford Escape, all-new and impressively thought out for the 2013 model year, is one of the segment's leaders in style, fuel-efficiency and high-tech features. Offering a choice of peppy and efficient engines, sporty handling and the updated MyFord Touch infotainment system, the new Escape also features an available power liftgate that many families love. With its redesign clearly a departure from its previous boxy shape, the 2013 Ford Escape, according to most in the automotive press, is a breath of fresh air: competent, stylish, fun-to-drive, good fuel economy, lots of high-tech features, and affordably priced (at least, in lower trim levels). But the new Escape is not without a few nits from the automotive press. Consumer Reports took issue with its limited cruising range, narrow driving position, the rear seat that lacks support, controls that can be complicated and, finally, an expensive price for what you get. At over $36,000, the fully-loaded Titanium tester, said the publication, is "more a competitor for upscale small SUVs such as the Audi Q5 and BMW X3." In several owner review sites, including Edmunds, Kelley Blue Book, AOL Autos and Yahoo Autos, it's kind of a mixed bag of comments about the 2013 Ford Escape. Some owners love the vehicle, while others have a love-hate relationship - really liking certain aspects of the compact crossover and disliking others, and still a few more that say they're sorry they bought the new Escape. Owners commenting on Kelley Blue Book - which resulted in an overall 7.5 rating out of 10 - say they like the fun-to-drive nature, the styling, "super" features such as Park Assist, 2.0-liter turbocharged EcoBoost engine, good size, comfort and great value. Others on the site posted complaints ranging from bad seats, mileage lower than expected, gripes about Sync (not working with iPhone, constantly resetting, etc.) and MyFord Touch (confusing small buttons, tough to learn how to use), and one who claimed that the new electric steering is hard to adjust without everyone feeling the movement. On Edmunds, owners felt much the same way, some really enthusiastic about getting into their first Ford, while others wishing they'd stuck with their previous make/model. Complaints included rattling sunroof, malfunctioning door locks, and a few other nits. Pluses included fun-to-drive, smooth ride and responsive engine, quiet and high-quality cabin, "fantastic" stereo on the Titanium, lots of cup holders, plenty of storage, and fits well into tight parking spaces. Comments on other owner review sites echo those mentioned above. The overall consensus, however, is that the 2013 Ford Escape is a practical, fun-to-drive, comfortable and good-handling compact crossover that can get expensive, depending on trim and options selected. 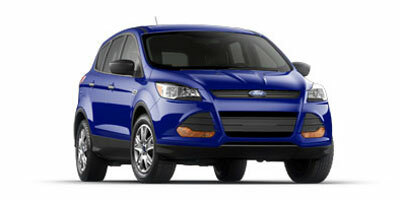 The 2013 Ford Escape is a compact crossover SUV. It is available in four trim levels: S, SE, SEL and Titanium. Standard features in the entry-level Escape S trim (only available with front-wheel drive), include air conditioning, tilt/telescopic steering wheel, cruise control, remote keyless entry, cruise control, split-folding rear seat, 17-inch wheels, power windows, locks and mirrors, and four-wheel disc brakes. Next up is the Escape SE, adding the Ford Sync infotainment system, satellite radio, compass, automatic headlights, fog lights, outside temperature indicator and alloy wheels. The Escape SEL comes with a few more upgrades and additions, including leather-wrapped steering wheel, leather seats, heated front seats, dual-zone automatic climate control, illuminated visor mirrors, MyFord Touch, and 18-inch wheels. The top-line Escape is the Titanium trim, which includes keyless access and start, remote engine start, upgraded sound system, power liftgate with hands-free activation, xenon headlights, roof rack, rear-obstacle detection, and 19-inch wheels and tires. The base S offers few options: the Sync voice-command electronics interface, and steering-wheel audio controls. SE options include a power panoramic sunroof, dual-zone automatic climate control, navigation system, power liftgate, and 18-inch wheels. In the SEL, options include a cargo management system (power liftgate, roof rack, interior tonneau cover); Technology package (keyless entry and start, remote start, hands-free liftgate, reverse park assist, and 10-speaker Sony audio system with HD Radio); Parking Technology package (automated parallel parking assist, front- and rear-parking sensors, rearview camera, blind-spot monitor and cross-traffic alert); a panoramic sunroof, and a navigation system. Titanium options include a Titanium Technology package (xenon headlights, roof rack, interior tonneau cover, hands-free liftgate, reverse park assist), the Parking Technology package, a power panoramic sunroof, a navigation system, and full leather upholstery. Among its many fine attributes, note members of the automotive press, the 2013 Ford Escape feels substantial on the road, handling most bumps well and maintaining an even keel during cornering. The Escape is also praised for being fun to drive. The 2013 Ford Escape is the only compact crossover SUV with a choice of three in-line four-cylinder engines. The V6 engine from the 2012 Escape has been discontinued. The only transmission across all 2013 Escape trims is a six-speed automatic, which most reviewers agree is quite responsive. In the base Escape S, the standard engine is the 168-horsepower 2.5-liter four-cylinder engine. EPA-estimated fuel economy in the front-drive-only Escape S is 22 mpg city/31 mpg highway/25 mpg combined. Both the Escape SE and SEL come with a turbocharged 1.6-liter EcoBoost in-line four-cylinder engine that delivers 178 horsepower. This engine, in front-wheel drive configuration, achieves an EPA rating of 23 mpg city/33 mpg highway/26 mpg combined. All-wheel-drive versions are EPA rated at 22/30/25 mpg. The 2.0-liter turbocharged EcoBoost in-line four-cylinder engine, standard on Escape Titanium and optional on Escape SE and SEL, pumps out 240 horsepower. Fuel economy is EPA rated at 22/30/25 in front-wheel drive and 21/28/24 mpg in all-wheel drive. Towing capacity is up to 3,500 pounds with the 2.0-liter turbocharged EcoBoost engine, although with that comes the elimination of the hands-free liftgate option. Almost universally, car critics praise the spacious interior of the 2013 Ford Escape. With its roomy seating for five, the Escape also manages to offer good cargo space. The cabin is put together well and features high-quality materials, along with many high-tech features such as Ford Sync and Sync with MyFord Touch. Front and rear seats are spacious and comfortable, with the front row, say the reviewers, having good legroom. Indeed, only tall passengers might feel the need for more headroom. In the rear, the reclining rear seat also provides a lot of legroom and, like the front seat, only taller passengers might need more head space. Optional tech/entertainment features Ford Sync and Sync with MyFord Touch, even though improved and updated, are still considered by most of the automotive press to be confusing and hard to master. Although the Escape is the only vehicle in its class to offer a hands-free liftgate, some reviewers find this feature a bit fickle, meaning it didn't work every time and, with hands full of heavy pet or other supplies, a driver might lose balance trying to wave a foot under the rear sensor that automatically opens the liftgate. Cargo room is 34.3 cubic feet with the rear seats up and 68.1 cubic feet of storage space with rear seats folded. Reviewers note that this isn't as much overall cargo space as the Honda CR-V or Toyota RAV4, although it is still considered good for the class. In any family crossover SUV, safety has to take a front-row position. The auto critics agree that the 2013 Ford Escape offers the fullest complement of standard and available safety technology in this vehicle class. In government crash testing, the 2013 Ford Escape received an overall four-star rating from the National Highway Traffic Safety Administration (NHTSA). Within that overall score, the Escape earned four stars for frontal and rollover testing and five stars for side-crash testing. The Insurance Institute for Highway Safety (IIHS) gave the 2013 Escape a Top Safety Pick designation, awarding it the top "Good" score across the board in frontal offset, side impact, rear crash protection and roof strength tests. Standard safety equipment includes front-seat side airbags, a driver knee airbag, full-length curtain-type airbags, antilock disc brakes, traction control and stability control. Optional (or included in some higher trims and packages) safety technology includes a blind-spot alert, rear cross-traffic alert, front- and rear-obstacle detection, rearview camera, and automated parallel parking assist. Since the 2013 Ford Escape is a completely redesigned vehicle, there is no reliability data yet available. There have been several recalls for the vehicle since its introduction, however, including two for the 1.6-liter EcoBoost engine for coolant and potential fuel leaks, as well as a recall for carpet padding positioning that may affect braking and acceleration. Interested to see how the 2013 Ford Escape ranks against similar cars in terms of key attributes? Here are the 2013 Ford Escape rankings for MPG, horsepower, torque, leg room, head room, shoulder room, hip room and so forth.